Did you know Kingston Technologies no longer offers Kingston DT200 usb flash drives, DT-200 manufacturing discontinued. Does this mean you can find a bargain for DT200/32GB, DT200/64GB or DT/128GB on the internet, a cheap clearance price? No. 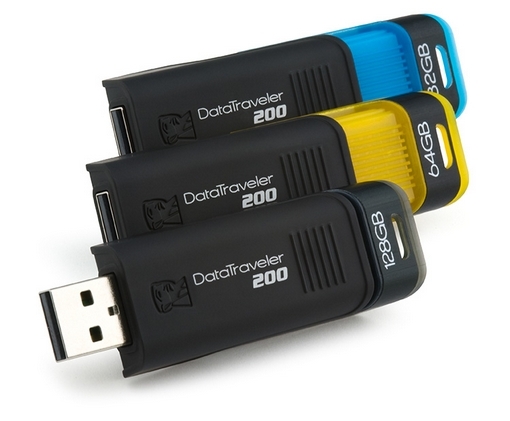 You are unlikely to get a real capacity DT200 DataTraveler inexpensively. The DT200 was a very expensive usb flash drive. FlashDriveFacts published Kingston Technologies Releases DT200 128GB USB Flash Drive To Market. FlashChipTutor captured prices these flash drives sold for in June 2009. The prices didn’t go down very much, only a little. They robust flash drives and Kingston was pioneering, the DT200 cost a lot to produce. In March 2010 we published Current Prices For Genuine Kingston DataTraveler 200 128GB USB2.0 Flash Drives DT200/128GB And For Fakes – A Guide. According to FlashChipTutor, Kingston Technologies was first to release a 128GB flash drive. It was the DT200/128GB. DT200 usb flash drives did not decrease in price. You can’t expect a genuine authorized Kingston seller to dump them at cheap prices. They won’t sell below original cost price. No one wants one wants to carry an inventory of old usb flash drive models. It is a sure way to loose money in a hurry. So If Kingston Technologies doesn’t make them anymore and if their authorized resellers discontinued listing DT200s, where do they come from? Are they real capacity DT200 usb flash drives? No, not likely – remember how expensive the cost and selling prices. If they are no longer by Kingston FABS who is manufacturing them? No Kingston FABs. The supply is coming from counterfeit operations. They use imitation casing shells. Packaging can be crude or sophisticated. Emphasis is to make it look like a Kingston DT200 usb flash drive. The flash storage chips inside are old chips nobody wants to buy or use in flash drives, usually 2GB or 4GB flash chips. Some times they are grade C or D chips! Is there still a market for the DT200? Yes. Every day you will find listings for DT200’s on eBay. According to investigators at FakeMemorySentinel, DT200 usb flash drives are mostly sold in buy now listings, at amazingly low prices. You would think people will have alarm bells ringing about the prices, but temptation prevails? As soon as the Internet Watchdogs for flash memory exposes these fakes, the sellers disappear. Or do they? The shocking truth is they don’t really disappear, the sellers just use a new id. It’s a new trend and keeps the flash memory watchdogs busy. A lot of consumers continue to suffer flash memory fraud. They buy these DT200 flash drives thinking they got a bargain for a discontinued Kingston DataTraveler. Soon they discover a horrible truth – when the usb flash drive malfunctions and files are corrupted. Should you consider buying a DT200 Kingston usb flash drive? Why bother? Kingston offers newer models with faster read write speeds and at cheaper prices. So far as we know, since Kingston stopped making them, the only remaining manufacturing or distribution is for the counterfeits, the fake capacity DT200s. Authorized Kingston resellers no longer offer them. The chances of getting genuine capacity is slim, the chances of getting a discounted price for the real usb flash drives is even less realistic. The truth is, it is not worth the risk to try and buy one on the internet. There is the new generation high speed DataTraveler. The list prices, less then what the DT200 cost when it was released. The DTU30 is USB 3.0 and backward compatible with USB 2.0. The DTU30G2/64GB is currently offered on newegg for only $144.99 US. DT200 flash drives in 2.0 USB have been replaced by a newer faster model! It is also a lot cheaper too. So why try to buy a DT200? Since almost all reputable internet flash memory sellers have sold their remaining inventory of DT-200 DataTraveler pen sticks, why would you take the risk? It’s a question that puzzles the FrankenFlash project. TechReporters believe DT200 fakes will continue to be sold for quite some time. The counterfeiting rings have a very large investment in these dangerous fakes. Don’t expect them to stop producing the imitations. It is the low pricing that will snare unsuspecting consumers. ← Sony 256GB USB Flash Drive Beware – eBay Guide?